Ted calls Lake Worth, Florida his home and is currently the co-founder of The New School of the Visual Arts in Jupiter, Florida where he also teaches watercolor, oil and acrylic painting, pastels and plein air painting. . He was formerly the Chair of Painting and Drawing at the Lighthouse Art Center Museum and School of Art in Tequesta, Florida. He currently also teaches at the Armory Art Center in West Palm Beach, Florida and the Boca Museum School of Art in Boca Raton, Florida. He has taught classes and workshops in Michigan and Vermont, and currently does domestic and international plein air workshops in Massachusetts, Maine, Italy and France and recently in Cuba. He majored in Watercolor at the Eastern Michigan University and also studied at Kendall College of Art and Design. He has worked in design related positions with Jacobson’s Store, Inc, Saks Fifth Avenue and Lord & Taylor. 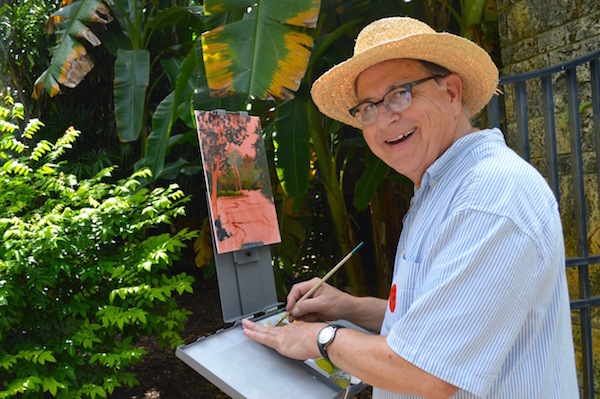 Ted founded and chaired the Annual Lighthouse ArtCenter’s Plein Air Festival for 2014-2016 in Tequesta/Jupiter Florida and acted as a consultant to the 2017 Annual Festival. The event drew 50 nationally and internationally recognized plein air artists to compete for $10,000 in prize awards. Artist’s Statement – Ted Matz, a contemporary realist and plein air painter. Ted is in constant awe of all the wonderful natural forms, structures, colors and patterns that can be found in the everyday world of Southern Florida. All of these amazing natural elements have inspired him to create as an artist. His hope is that by observing his artwork the viewer will be drawn to the beauty most people overlook and take for granted in their busy daily lives. My teaching philosophy and practice is based on the principle that it’s “all about you”. I’m not interested in teaching you to paint like me but in helping you to paint like you and to help you to become a more skilled artist with your own authentic voice. My course structure concentrates on teaching both the craft and the art of painting. The craft results from developing a strong visual language: value, composition, drawing, color, edges, details, variation, pattern, etc. My emphasis is on developing a strong sense of seeing—to include color, tonal relationships and an understanding of and the manipulation of what is seen. The art is all about finding your authentic voice and developing your self-awareness and self-confidence as an artist. To increase ones skill level there is no substitute for putting in long hours in the studio and by making a commitment to paint by painting. Fear, perfectionism, the need for approval, the aversion to risk-taking all contribute to inhibiting one’s commitment to painting and therefor preventing us from living up to our creative potential. The ability to deal skillfully with these issues is as important as the skill of knowing how to mix the right color or developing a strong composition. My goal is to have you recognize, understand, and manage your problems as well as your weaknesses, therefor allowing you to work more productively and creatively. • International Plein Air Painting Workshops, Cortona, Amalfi Coast and Farandola, Italy, Arles/St.Remy, France and Cuba. Creative Director of Advertising, Jacobson’s Stores, Inc.
Corporate Visual Merchandising Director/Stores, Jacobson’s Stores, Inc.